It’s the new headache for coaches, the next big thing that can ruin a locker room. It’s not hundred dollar handshakes or the sleazy side of recruiting. It’s drugs – only the source isn’t what you’d think. Three SEC coaches told me the No. 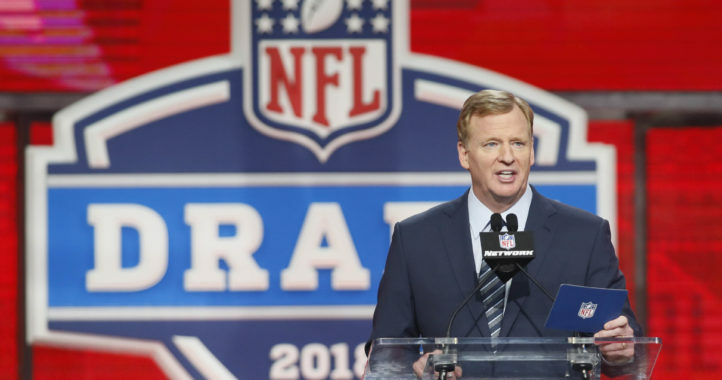 1 problem in enforcing university drug policies is the growing number of former players now in the NFL giving access to recreational drugs to current players. The underlying theme those three SEC coaches say can’t be counteracted is that drug use hasn’t impacted former players’ ability to play in the NFL and make money playing the sport. The drugs of choice: marijuana, synthetic marijuana and, in some cases, performance enhancing drugs. The biggest deterrent a coach can use for any behavior or drug use issue has always been the NFL, because the No. 1 goal for a majority of players is signing an NFL contract. In other words, if you screw up, it will affect your ability to get drafted. 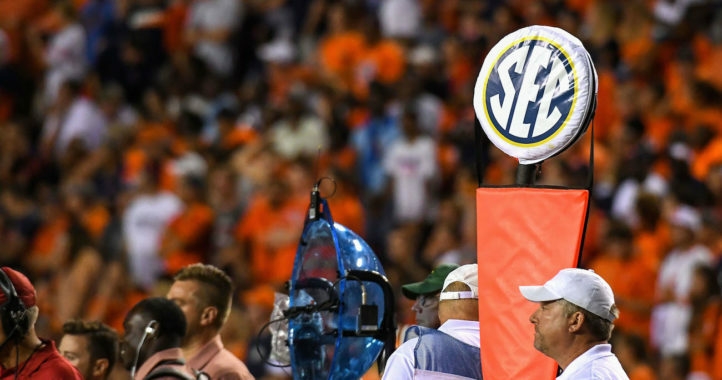 All three SEC coaches asked for anonymity so they wouldn’t “out” former players, but all three independently stressed former players facilitating drug use has been a growing problem over the past 12-18 months. The dynamic within college locker rooms is changing, they say, because the NFL is changing the way it deals with recreational marijuana use. NFL Players Association president DeMaurice Smith told the Washington Post in February that the NFLPA wants “issues of addressing (recreational marijuana use) in treatment” and that a “less punitive measure is appropriate.” He also stressed the NFLPA will only sign an extension to the Collective Bargaining Agreement – which runs through 2020 – after policy changes in recreational marijuana use are addressed. Under current CBA guidelines, players are subject to urine tests in the offseason and those who test positive are entered into an intervention program. Additional violations could include fines and suspensions ranging from two games to a full season. Under the CBA, players can only be tested between April 20 and Aug. 9, and are given a three-hour advance notice. Meanwhile, a first positive test – on a random test — for most FBS programs (drug policies vary within the FBS) brings a one-game suspension. Punishment for additional positive tests can include multiple-game suspensions and/or removal from the team. 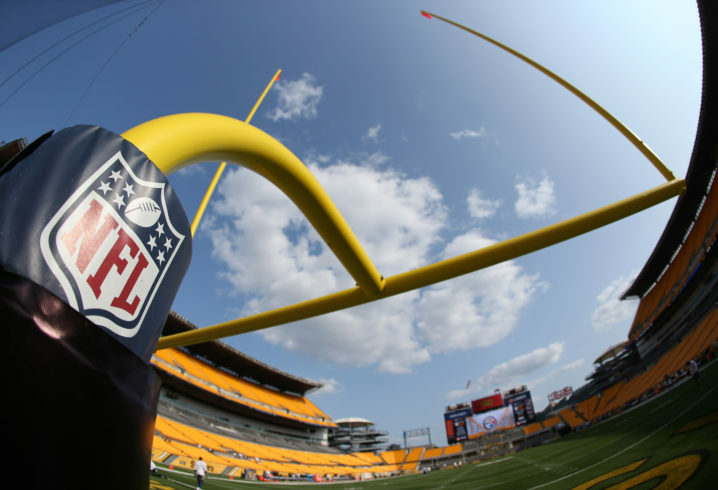 NFL players using a PED masking agent are suspended for two games without pay, and those caught using anabolic agents or stimulants are suspended for four games. A second positive test is 10 games; a third is two seasons. The NCAA ban on PEDs includes a year suspension for a positive test. The consequences for drug use, coaches say, don’t mirror each other at the college and professional level and creates confusion (and excuses) for players. And leads to problems in the college locker room. Danny Wuerffel and Peyton Manning have been replaced by Felipe Franks and Quinten Dormady. Steve Spurrier and Phil Fulmer are now Jim McElwain and Butch Jones. Yet somehow, this week’s version of Florida-Tennessee seems just as important as those classics from the mid-1990s, when the winner had the upper hand in the SEC East and national title chase. Think about this concept: one of the two most successful coaches in the SEC East over the past two seasons will be facing some uncomfortable pressure after this weekend. So, yes, big. Real big. Jones spoke this week about his team needing to get tougher. 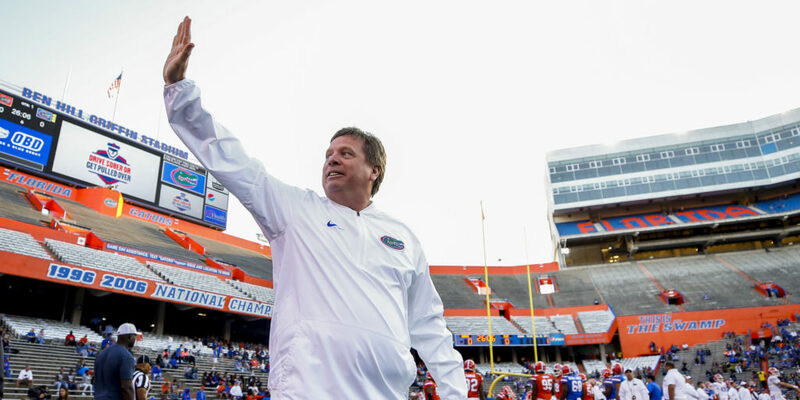 McElwain spoke last week about placing the blame for Florida’s inept season opener on him – and now, because of a natural disaster, the Gators were forced to cancel a tuneup game last weekend against Northern Colorado. If Tennessee wins, Florida will have started a season 0-2 for the first time since 1971. Imagine that ammunition for Florida fans already grumbling about McElwain, who has won 18 games and played in the SEC Championship Game the past two seasons. A loss to the Vols would come on the heels of a humbling emasculation (what else can you call it?) at the hands of Michigan to begin this season, followed by another loss to a team the Gators had beaten 11 consecutive times prior to blowing a 21-3 halftime lead last season. Then there’s Jones’ unique situation. Tennessee had become a shell of its former self in the waning years of the Fulmer era, and the Lane Kiffin and Derek Dooley years. All Jones has done is breathe life into a stale program, rebuilt a recruiting base and won nine games in each of the previous two seasons. But there’s no SEC East title, and a handful of ugly losses (hello, South Carolina and Vanderbilt). Lose to Florida this weekend — after somehow finding a way to beat Georgia Tech in the season opener despite giving up more than 500 yards rushing — and winning the East for the first time since 2007 just got a lot tougher with the emergence of both Georgia and South Carolina. The drama delivered by Wuerffel and Manning and Spurrier and Fulmer has finally been matched in this bitter rivalry. By two demanding and unforgiving fan bases. Blowing a 34-point lead is bad enough. Not getting the ball to the best player on the field is Kevin Sumlin’s biggest problem two weeks into a win or walk season. When you have an elite talent like wideout Christian Kirk, the game plan should be built around getting him touches. The Aggies all but ignored Kirk against UCLA, and then did it again the following week against Nicholls State. In Week 1 vs. UCLA, the Aggies ran 93 plays and Kirk had seven touches (5 catches, 2 rushes) for 59 yards. Against Nicholls State, the Aggies ran 83 plays and Kirk had seven touches (6 catches, 1 rush) for 75 yards and a touchdown. So the best player on the field at Texas A&M – the most dynamic and game-breaking player — has 14 touches in 158 plays (Kirk also has six kickoff returns). 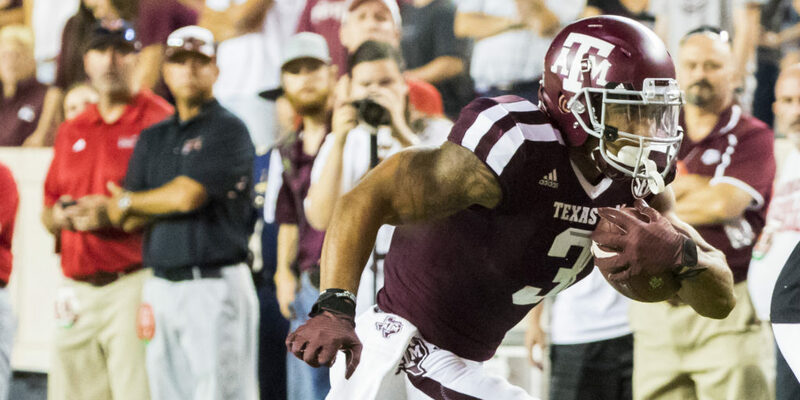 Now is the time for Texas A&M, in the SEC opener against Arkansas, to zero in on Kirk. Because if you want to blame Sumlin for something, look no further than the inability to get the ball to his best player. We’ve seen this over and over with Dan Mullen teams at Mississippi State. The big moment arrives, and the Bulldogs wilt. Except, that is, during the 2014 season — when a dual-threat quarterback (Dak Prescott) and a stingy, turnover-creating defense led the Bulldogs to a 9-0 start and the No. 1 ranking in the College Football Playoff poll. A week later, the ride ended with a loss to Alabama. Fast forward to this season. Mississippi State has another elite, dual-threat quarterback (Nick Fitzgerald), and another stingy defense. The next step: Saturday’s game against LSU in Starkville. Three years ago, Mississippi State was an unknown, and began the season with wins over Southern Miss, UAB and South Alabama. The Bulldogs then ripped off consecutive top 10 wins over LSU, Texas A&M and Auburn on the way to 9-0. Mississippi State has wins this season over Charleston Southern and Louisiana Tech, and is staring at three consecutive top 15 games — against LSU, at Georgia and at Auburn. Win those three, and another 9-0 start is a lock. So is a date with Alabama in Week 10. My phone was buzzing Saturday night during Auburn’s 14-6 loss to Clemson. On the other end of a string of texts was an NFL scout, baffled by the Auburn offense. His gripe: Jarrett Stidham, Auburn’s quarterback, was being put in position to fail. 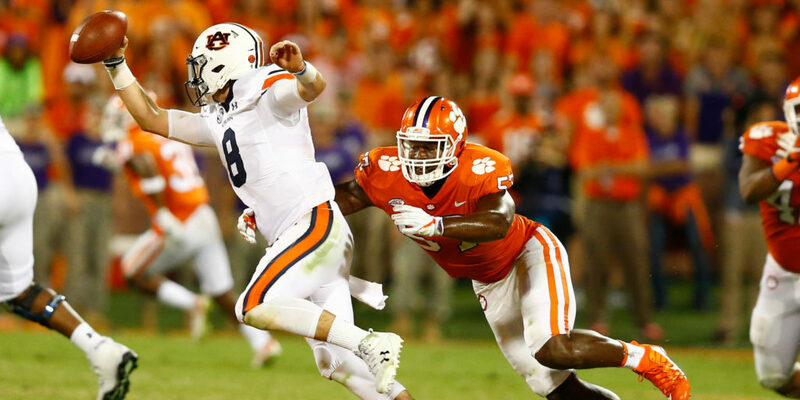 Clemson’s ferocious pass rush was eliminating any hope of play-action throws or misdirection fakes and throws that Auburn uses in coach Gus Malzahn’s offensive system. This, of course, will be a major issue moving forward for Auburn. The Tigers might be able to dictate tempo on offense in some games, but will face a Clemson-type pass rush against SEC West Division rivals LSU and Alabama. Either adjust, or continue to fail against teams that can rush the quarterback with only the front four. Rolling out (you’re not outrunning those defensive ends at Clemson – or Alabama and LSU) wasn’t the only problem with the scheme. Because Auburn’s system is based on the power run, the Tigers often use bunch sets in the run and pass games. Stidham and his strong arm and skill set are a better fit for an offense like Baylor used with former coach Art Briles: receivers at the numbers, forcing defenses to spread and cover or play man. Either way, it’s a significant advantage for an accurate thrower. Derek Mason said all summer that this would be the best defense he has had at Vanderbilt. We’re two weeks into the season, and the Commodores are unbeaten and among the nation’s leaders in defense heading into a brutal stretch of games that will have a significant impact on Vandy reaching back-to-back bowl games for only the second time in school history. It’s easy to point to Vanderbilt’s opponents the first two weeks (Middle Tennessee, FCS Alabama A&M) as the reason the Commodores are unbeaten. But look deep into the numbers, and you’ll see a defense with the potential to help steal a game or two over a brutal stretch of games the next six weeks. Five of the next six teams Vandy will play are unbeaten after two weeks, and the one that isn’t (Florida) historically owns the Commodores. Vandy plays host to unbeaten Kansas State this weekend, then plays Alabama, at Florida, Georgia, at Ole Miss, at South Carolina. But there’s hope: a defense that has given up less than two yards per play (218 yards, 110 plays), leads the nation in opponent third down conversion at 7.69 percent (2 of 26) and has 20 tackles for loss. The first big test is this weekend against K-State’s dual threat QB Jesse Ertz, who is completing 70 percent of his passes and has five touchdowns through two games. Hey Matt: Is there really that much of a gap between Alabama and the rest of the SEC? Darren: The previous three seasons, it has been Alabama and the 13 Dwarfs. There’s no way around that. This season, though, could get interesting in the West Division. We’ll focus on the West because the East, frankly, is a mess. There are two teams in the West – LSU and Auburn – that not only can compete with Alabama, but could beat the Tide. New LSU offensive coordinator Matt Canada has changed the way the Tigers think about throwing the ball with QB Danny Etling and a strong group of receivers. The Tigers can stretch the field now in the passing game (with accuracy, and with a group of wideouts who can go get 50-50 balls), and that will only enhance their ability to run with power behind tailback Derrius Guice. Auburn, meanwhile, will also give Alabama problems with a balanced offense and a stout defense. Don’t look at last weekend’s loss to Clemson and think this Tigers team can’t still win the SEC. Clemson coach Dabo Swinney has built a program that mirrors Alabama: the foundation of a wicked defensive line and a strong running game, and a quarterback who takes care of the ball. At this point, Clemson is as good a pick for the College Football Playoff as anyone. Auburn will get better in the passing game (see above) and be a factor in the West Division race in November. 11.77. Of all the bloated numbers for Ole Miss quarterback Shea Patterson after just two games (918 yards, 9 TDs, 77 percent completions), none is more impressive than his yards per attempt – the most important number for many NFL scouts. Oklahoma’s Baker Mayfield led the nation last year at 11.1. While South Alabama and UT-Martin didn’t put up much resistance for Ole Miss, this week’s game at California (a 10:30 p.m. ET start) will be an opportunity to show Patterson’s hot start isn’t built on non-conference cupcakes. “I never felt like it got too big for him.” – Georgia coach Kirby Smart on freshman quarterback Jake Fromm’s first start last week at Notre Dame. I know it’s nitpicking, but Butch Jones has never lost to Kentucky while at Tennessee. I’m sure you meant South Carolina. No it isn’t nitpicking. No research done obviously. Tennessee won the East in 2007 and lost to LSU in the SEC Championship. Research is your friend!!! This isn’t nitpicking either but Mississippi State was #1 for 5 weeks not just 1. I understand it’s not that long of a time but still get the facts right man. oh no! Marijuan!?!?!?! it’s 2017. it’s basically legal everywhere except the backwards south. That’s not really true. It’s illegal in far more states than legal and it’s beyond just the South. Also, even in states where they’ve repealed state laws criminalizing weed it’s still technically illegal under Federal law. We need wholesale repeal period but that will take a while. Regardless, weed is an issue for sports as long as the NCAA and NFL include it as a banned substance. Colleges don’t give an ish about pot, they’re not enforcing a law, but they do have to enforce school policies (if a school administered test) and NCAA policies (when it’s a NCAA screen). Most will never get caught smoking a lil weed but some do and they and their team pay for it. The solution is pretty simple – the NCAA should NOT be testing for recreational non-performance enhancing drugs. News flash. Football players discover that smoking weed is harmless. You must have forgotten the last few years that Ole Miss actually beat Bama two years in a row and should have beaten Bama last year but had an epic collapse in the second half. I”m not saying that Bama isn’t the gold standard because they are, but saying that in the last few years it has been Bama and the 13 dwarfs isn’t exactly true. As far as drugs, football players aren’t known for being that smart. I laugh at the people that actually believe that smoking weed is harmless. I wish the punish would be a lot more severe.